Now that the umbrella of "protection" by corrupt officials and law enforcement evaporated once President Trump took office many unscrupulous officials, judges, attorneys, cops, etc. will be investigated and prosecuted . AirWatch VP ( former City of San Antonio CTO) Hugh Miller is once such dishonest, unethical, corrupt person. San Antonio Texas Chief Technology Officer Hugh Miller has played a central, pivotal role in the ongoing RICO-like criminal conspiracy to conceal decades of public / police corruption involving tens of millions of public dollars. Miller joined in efforts to conceal the theft / fraud when it was reported in 2005 , retaliated against whistle-blowers in 2006, helped coach city witnesses to present false testimony / to defame the Bexar County 57th District Court in 2009 , continued to conceal “cooked” books during HUD investigation - HL-10-0465 , participated in almost four years of illegal city meetings , stood by when the Federal Court was defamed in 2013 to hide the cover-up, remained silent when Bexar County District Attorney LaHood helped conceal the conspiracy and Texas Open Meeting Act violations in 2015 / 2016 and helped publish “cooked” books designed to defraud financial institutions / underwriters and municipal bond investors ( SEC- FWRO 302036). Miller recently accepted the position as Vice President with Airwatch, Inc. - a San Antonio start-up acquired by VMware - a member of the Dell Technologies family of businesses. A report “ Fraud Upon the Court” ( posted at CASTROGATE.COM and submitted to the SEC, the FBI, the DOJ, HUD, etc) ) details Miller’s efforts in 2009 to illegally help coach witnesses to lie under oath in Court so as to conceal the criminal activity of City persons that took place since 1982. 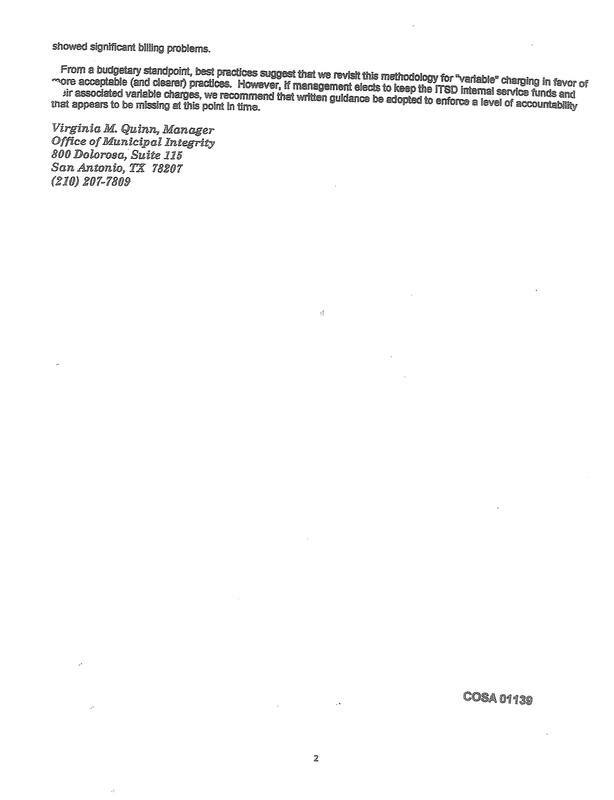 Internal documents show that over the past several decades City persons secretly, illegally used the internal telephone billing account - the “variable” , the City’s Avaya telephone contract and other means to pilfer up to $5.2 a year from Private, City, County, State and Federal coffers in violation of the law. 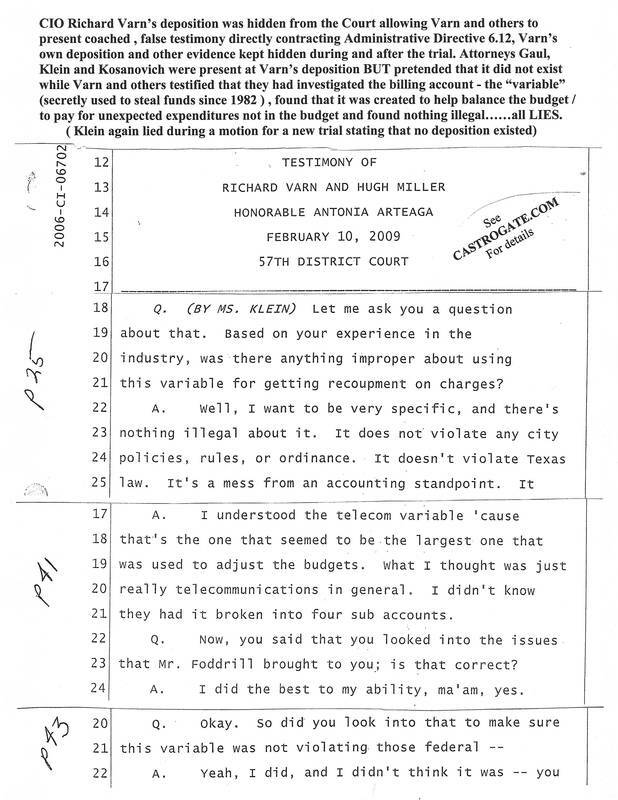 In 2009 ( with the support of City Attorney Michael Bernard ( brother of White House Social Secretary Jeremy Bernard) , Miller sat with attorney Deborah Klein and attorney Mark Kosanovich in the 57th District Courtroom and helped coach known, fabricated, false testimony from numerous witnesses including Texas Ranger Capt.Hank Whitman, City CIO Richard Varn, IT Manager Diana Gonzalez, Deputy City Manager Peter Zanoni , Municipal Integrity Manager Virginia Quinn and many other dishonest persons. Attorney Malinda Gaul was paid over $10,000 to expose the criminal cover-up but instead joined in efforts to finance a “Fraud upon our Court” with tax dollars and to conceal reams of critical evidence in an effort to cover-up decades of criminal activity and public / police corruption . They presented a well-rehearsed fabrication to the Court while they hid material evidence directly contradicting false testimony offered under oath including CIO Varn’s deposition, Administrative Directive 6.12, a search warrant for the bank records of City IT Manager Jose Medina, documents showing how Medina and city vendor Isabel Gonzaba ( IG Communications) stole upwards of $200,000 via the City’s Avaya contract, decades of state/federal grant fraud via the internal billing account - “ the variable” , decades of “cooked” books, aggravated perjury , falsification of government documents and other crimes. The illegal cover-up encompasses other Agencies and other Courts. While Gaul helped defraud our Judicial System and conceal the criminal conspiracy her husband Alamo Area Council of Governments -AACOG Director Grant Gaul - helped conceal the illegal activity inside AACOG with the assistance of Director Dean Danos, Director Mike Quinn, City Municipal Integrity Manager Virginia Quinn ( Mike's spouse) , Bexar County Commissioner Kevin Wolff and others. SAPD Chief William McManus, City Attorney Michael Bernard, the City of San Antonio ( represented by Mayor Julian Castro) and attorney Shawn Fitzpatrick presented known false testimony to Federal Judge Xavier Rodriguez in an effort to conceal the “fraud upon the court” and the ongoing criminal conspiracy. These and many other issues are presented at CASTROGATE.COM. Hugh Miller's courtroom testimony is posted below in three segments. Attorney Malinda Gaul never deposed Miller before the trial. Attorney Gaul never asked anyone why the Telecommunications Manager was terminated. Attorney Deborah Klein and attorney Mark Kosanovich coached false, defamatory testimony from Miller in an effort to discredit the whistleblower and his reports. The personal history file of the City's Telecommunications Manager contained no information concerning any counseling or behavioral problems. It DID contain a reference to the Telecommunications Manager being awarded " Employee of the Month". Depositions by City employees Diana Lopez, Michael Mitchell and Jim Garcia contradict the false, defamatory statements by Miller. Miller and other City witnesses lied about the criminal use of the "variable" and lied about the whistleblower reporting the criminal activity and illegal cover-up. Bernard, Gaul, Klein, Kosanovich and other attorneys who have joined in efforts to hide the illegal cover-up while pretending to be following the law will be brought to justice. The liberal media “black-out” / cover-up / Fake News will end. Recent criminal acts by Bexar County District Attorney Nico LaHood and others designed to conceal the conspiracy have tolled the statute of limitations once again allowing for current investigations and prosecutions . “ Fraud Upon the Court” has no statute of limitations . Documents, correspondence , transcripts, depositions, recordings, audits, reports, etc. can be seen at CASTROGATE.COM. The “Fraud Upon the Court” chapter exposes Miller’s criminal acts before the Court while other chapters provide background information. 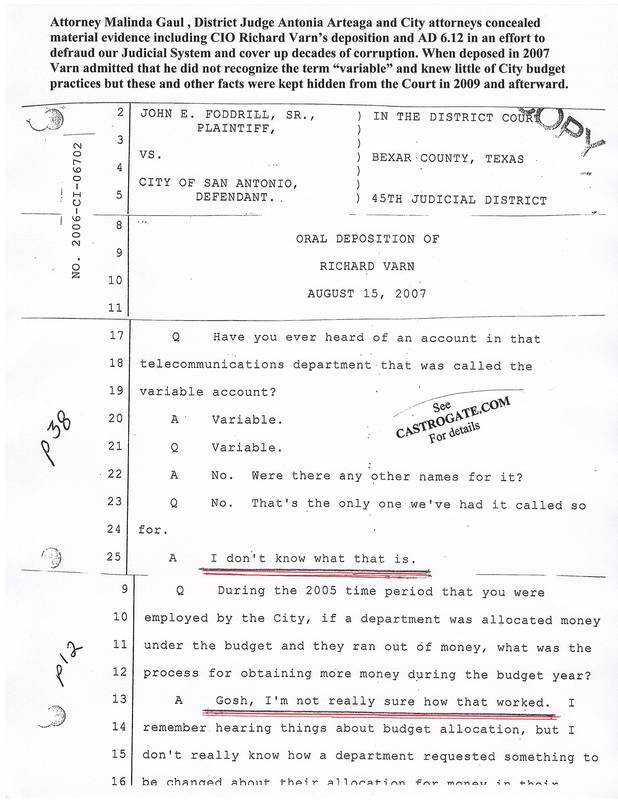 The 2007 deposition of Chief Information Officer Richard Varn was kept hidden from the Court and has been kept hidden for the past eight years by City Attorney Michael Bernard, attorney Malinda Gaul, attorney Deborah Klein, attorney Mark Kosanovich, Judge Antonia Arteaga and many others, When deposed Varn stated that he did not recognize the term " variable", knew nothing of any such account and knew little of city budget procedures. The Court and the Jury never saw Varn's deposition thus allowing Miller , Klein and Kosanovich to coach false testimony from City witnesses. 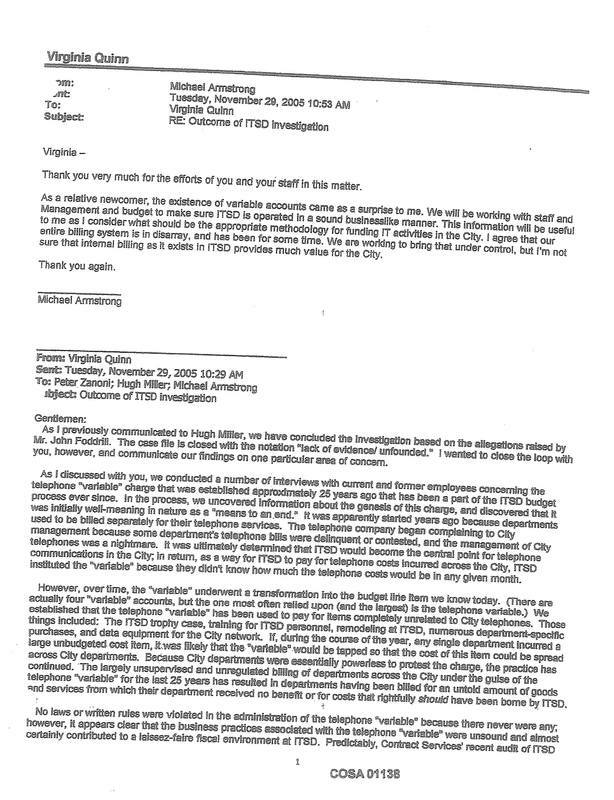 In 2005 CTO Hugh Miller knew that the "variable" billing account had been illegally used to siphon funds from Private, City, County, State and Federal Budgets. He helped Budget Director Peter Zanoni, CIO Michael Armstrong, Municipal Intercity Manager Virginia Quinn and others conceal the criminal activity, helped halt internal investigations, helped hide documentation and retaliated against whistleblowers. In 2009 Miller sat with attorneys Klein and Kosanovich and helped coach false testimony from City witnesses in an effort to conceal the illegal activity and ongoing criminal conspiracy. In 2010 Miller and others presented known false financial information to Federal investigators in HUD case hl-10-0465 in an effort to conceal decades of HUD and other grant fraud. Sadly HUD Special Agent Victoria Marquez and others participated in the cover-up so as to protect corrupt politicians , attorneys, Judges, etc. with ties to the White House.